Hughton applauding the Brighton faithful after the defeat to Manchester City at Wembley. Image courtesy of Mike Hewitt on Getty Images. The Brighton manager spoke about team news, the group's morale and how many points they need to stay up. 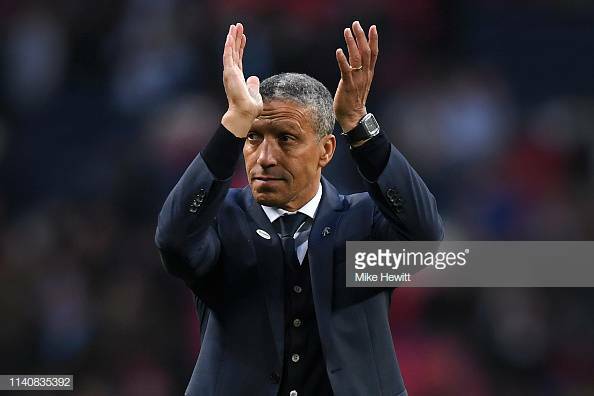 Brighton & Hove Albion manager, Chris Hughton gave an update on his team ahead of the game against Bournemouth on Saturday. “Well Solly has just done a bit of training today and Pascal also trained today, but of course he has been out for a while so all of them decisions will be made today. But at this moment everyone has trained this morning. Hughton was also asked about what spirit the side is in after the defeat to City: “No the players have been okay there are two sides of it. One is of course is the disappointment of not going through, but I think the biggest thing we can out of it is the performance, that we hope hasn’t done us any harm and a performance that we hope we can take into this final group of Premier League matches and that’s the aim. “To run a top-class team like Manchester City, with the quality and the options they have fairly close speaks volumes for the group of players." One thing the Brighton manager wasn't sure on was how many points his side need to guarantee survival in the Premier League:“Again the answer is I don’t know, I wish I did know, but having said that what you don’t want to be doing is going into any game thinking that you are nearly there and can take your foot off the pedal. "I don’t see that happening everybody is fighting at the moment. Of course, we know the fate of the two teams in Huddersfield and Fulham at this particular moment and everybody around that bottom group of teams will be fighting and our attitude has to be exactly that.